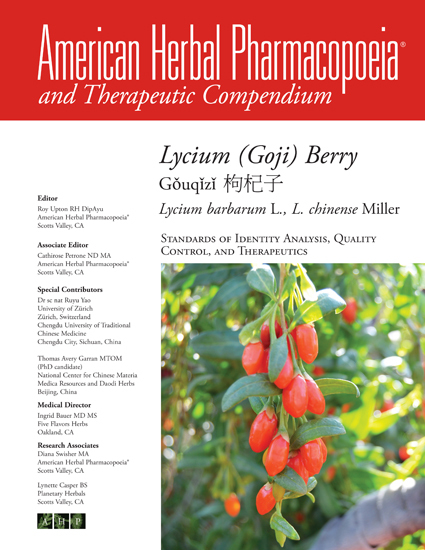 The AHP Lycium Berry monograph establishes standards for ensuring authenticity, purity, and quality control of lycium fruit, and represents one of the most comprehensive standards for this botanical in the English language. In recent years, lycium products, especially juice products, have grown exponentially in the North American marketplace. There are a variety of species and grades of lycium that are used and this monograph provides detailed sourcing and testing information. The monograph was a collaboration of researchers and experts in North America, China, the United Kingdom, and the European Union and included experts in botany, chemistry, traditional herbal medicine, medicine and pharmacy, pharmacology, and pharmacognosy. Not only is it one of the most informative works on lycium, but is aesthetically beautiful.